Home Costs > How Much Does a Fireplace Mantel Cost? How Much Does a Fireplace Mantel Cost? A mantel is used as the decorative framework around your fireplace and often have elaborate designs that could sometimes reach as high as the ceiling. A mantel emphasizes on the artistic features of your room, adding an additional layer of design. How much does a fireplace mantel ocst? On average, a fireplace mantel can cost $150 to as much as $2,500 or more. The prices can be all over the place because of the quality, finish, material and if it’s customized can greatly affect the cost. A simple fabricated mantel found at Home Depot or Lowe’s can cost as little as $150, while a mantel made of oak with intricate designs can cost $2,000 or more. A higher-end custom made mantel, such as a marble fireplace mantel that has a traditional Italian design, can cost anywhere from $3,000 to $11,500 or more. 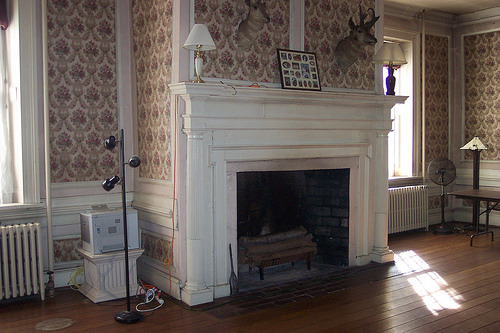 This Old House says a salvaged antique mantel can cost $750 to $3,000. Custom mantels will be used if you want your own unique design or the mantel isn’t a standard size found in most retail stores. The prices noted below won’t include the professional installation. To have a professional contractor install a fireplace mantel, plan on spending an additional $250 to $700, depending on the size and complexity of the job. Fireplace surrounds that are built to go around a fireplace can vary from $300 to $2,000 or more. These surrounds can be made with wood and/or stone. Simpler designs with a contemporary style and natural finishing can cost $300 to $900. Mantels that have an antique look, such as using victorian wood, can cost anywhere from $300 to as much as $900. Those that have a rustic look could range from $200 to $800. Actual salvaged antique wood could be much more, costing $700 to $3,000 or more. A fireplace mantel stone wall can cost anywhere from $2,500 to $6,500 installed, depending on the size, stone being used and contractor. A floating mantel, which appears to be “floating,” can cost $150 to $400. A reclaimed wood mantel can cost $250 to $1,750, depending on the finish options and colors. DIY or Not says the average professional cost is $1,498 and 51 percent recommend hiring a professional to do the job. Any homeowner will find an array of styles and elements are virtually any home improvement store. Mantels will either sold as components or as a kit with everything you need to install it such as a shelf, surround and the pilasters to decorate it. If the mantel isn’t customized, it will usually come in three pieces and will be put together using a twist cam lock. Usually, wood is the most common option, followed by stone, and each mantel will be designed with its own unique taste to define its character. For example, some mantels may be stained, while others will be painted. Opening widths will commonly be 36, 42, 48 and 54 inches but can be anything more or in between if customized. Plain wood mantels may need to be painted over for an additional layer of texture. Paint can cost anywhere from $20 to $50 per gallon, depending on the type of paint you purchase. Additional supplies and tools will be needed to install and mount the mantel if you choose to install it yourself. Some of the tools needed will be wood glue, a tape measure, a drill, drill bits, screwdrivers and nails. Relocating the mantel and/or modifying any plumbing, electrical or framing can increase the price. For example, some people have an electrical outlet installed nearby to plug in a lamp. Changing or adding a fireplace surround can add $1,500 to $3,000 to the total cost. Some opt to purchase accessories such as shelves or additional decorations to complement the mantel. Surrounding the fireplace with stone can cost thousands more, depending on the stone being used and the size of the job. Before you purchase any materials, measure the dimensions of your mantel to make sure you’re getting an exact fit. Unless you want a different size, having these measurements will make shopping much easier. Fire code states that a surround must be six or more inches, depending on how thick the mantel is, from the firebox In addition to this, the hearth must extend at least 16 to 20 inches in front of the firebox and eight to 12 inches on either size. All materials must be noncombustible such as brick, tile, marble, granite and slate. The more complicated the design is, the more expensive the mantel can be. If you want to keep it simple, consider a simpler prefabricated wood mantel which comes in one piece. This mantel is simply fastened to the wall and the corners are caulked any painted. Save on installation costs by installing the mantel yourself. Some kits purchased online have all the necessary supplies to get the job done. Doing so can cut the job cost in half when using a professional. If you already have a mantel in place, consider having it refinished. A simple refinish job, especially if you do it yourself, can be less than $250. If considering hiring a professional contractor, try out websites such as HomeAdvisor.com. Simply describe your job and have contractors quote you for free.